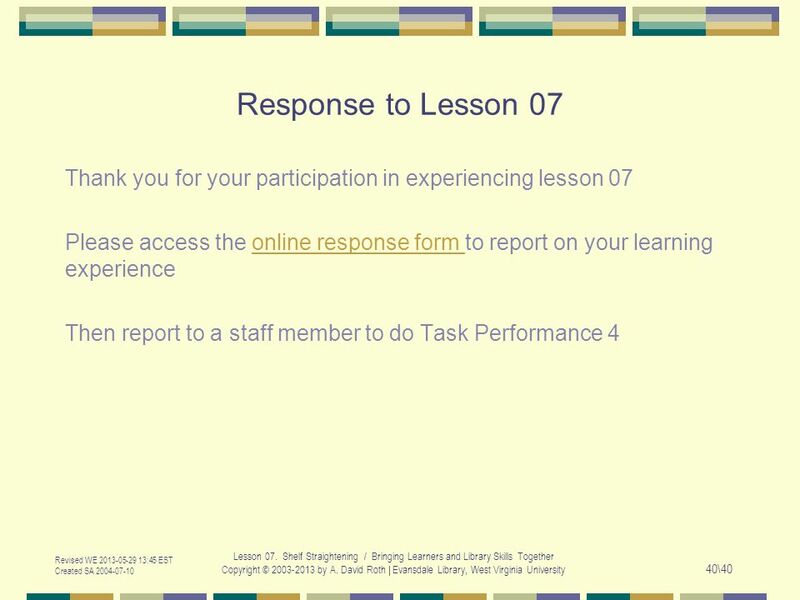 Revised WE 2013-05-29 13:45 EST Created SA 2004-07-10 Lesson 07. 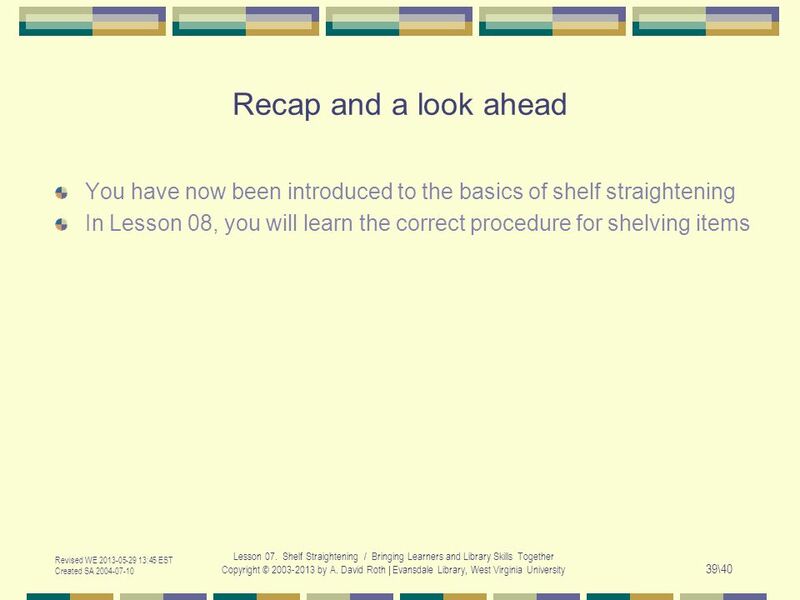 Shelf Straightening / Bringing Learners and Library Skills Together Copyright © 2003-2013. 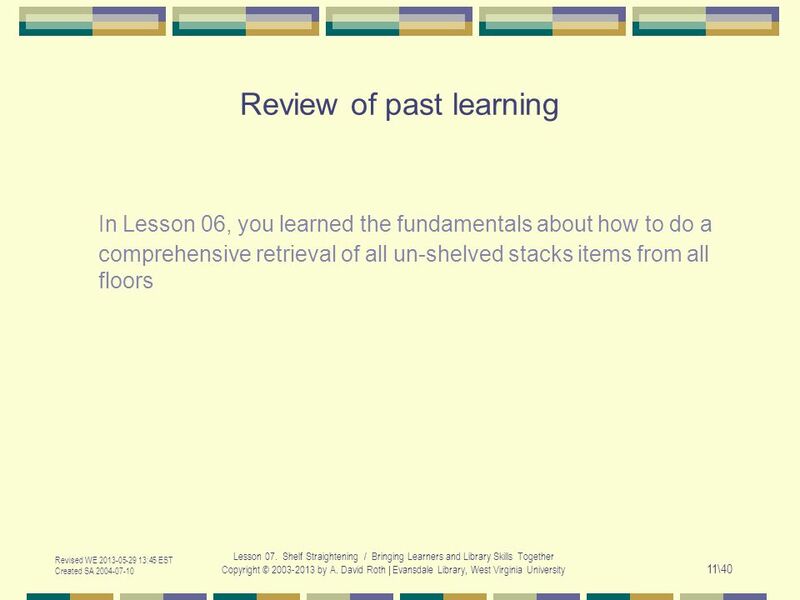 5 Revised WE 2013-05-29 13:45 EST Created SA 2004-07-10 Lesson 07. 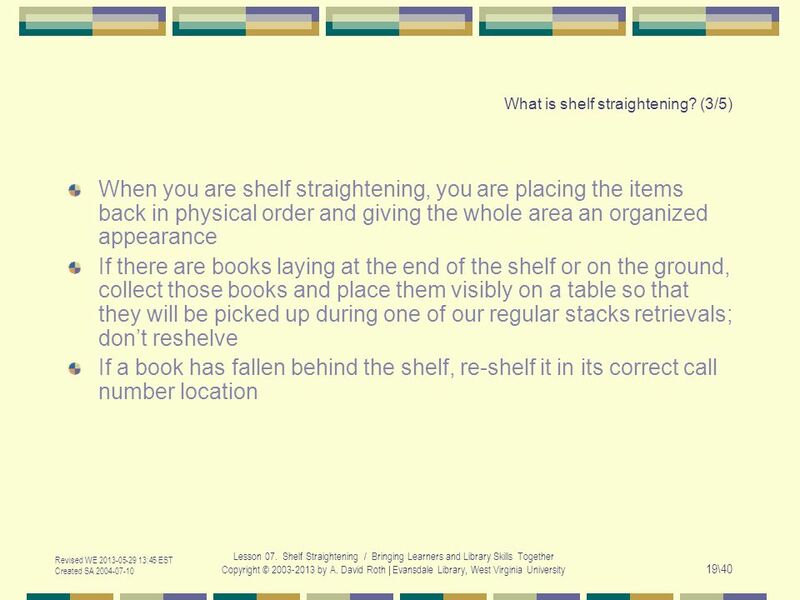 Shelf Straightening / Bringing Learners and Library Skills Together Copyright © 2003-2013 by A. David Roth | Evansdale Library, West Virginia University 5\40 How can these resources be organized, so they are accessible to people? 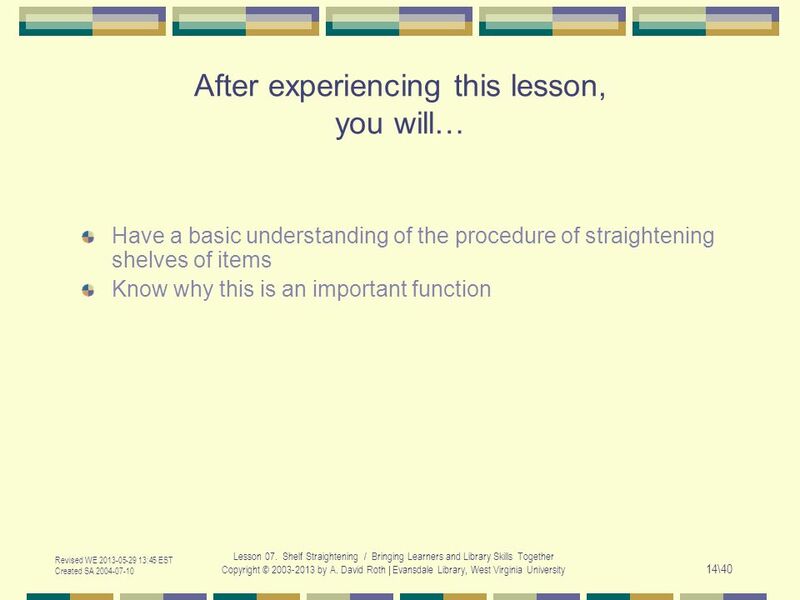 16 Revised WE 2013-05-29 13:45 EST Created SA 2004-07-10 Lesson 07. 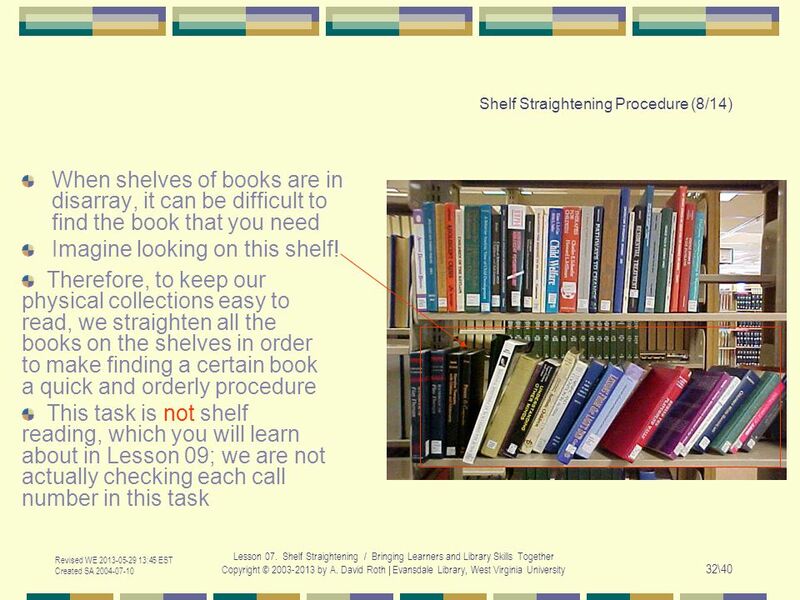 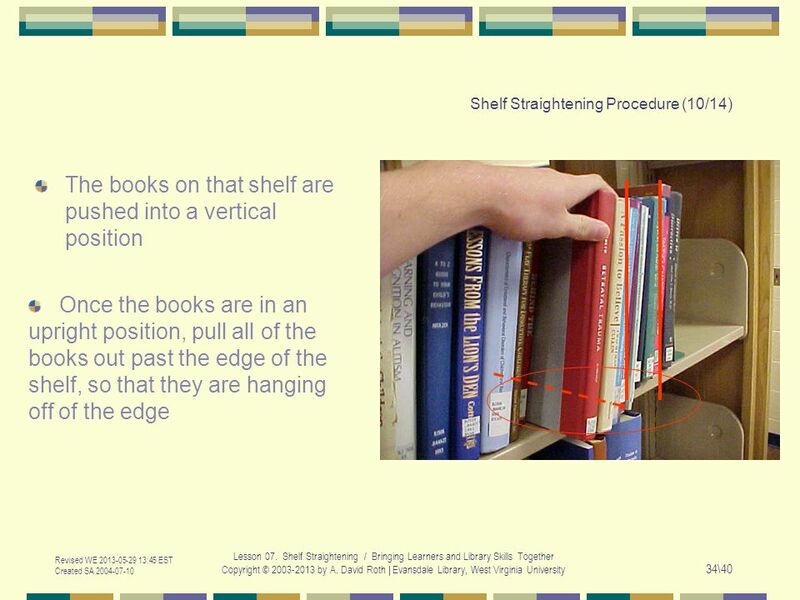 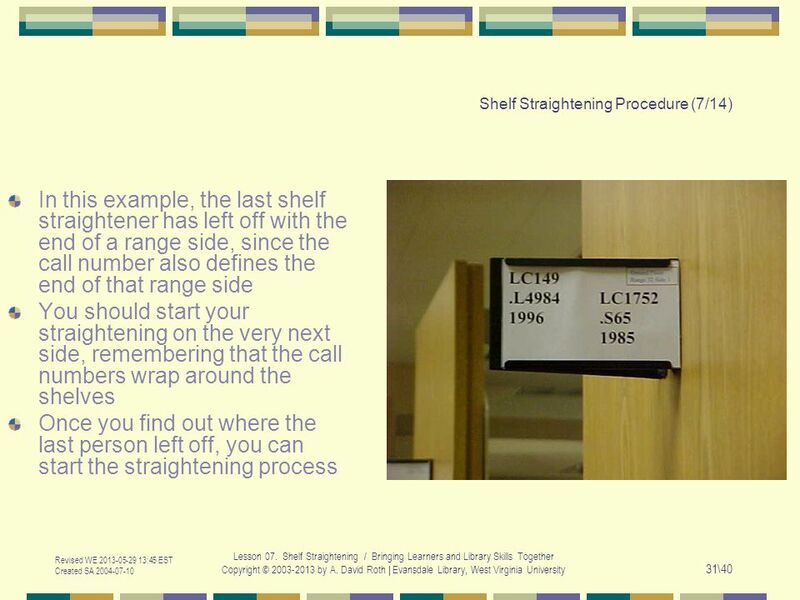 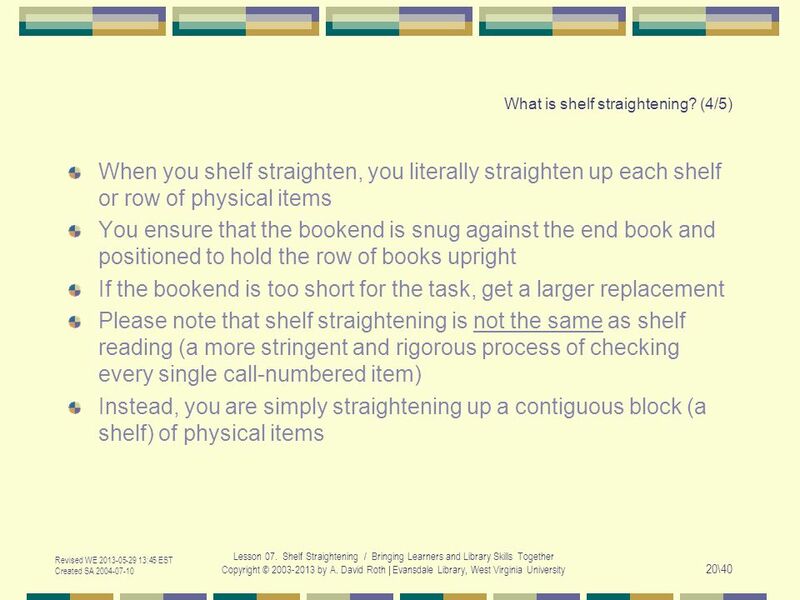 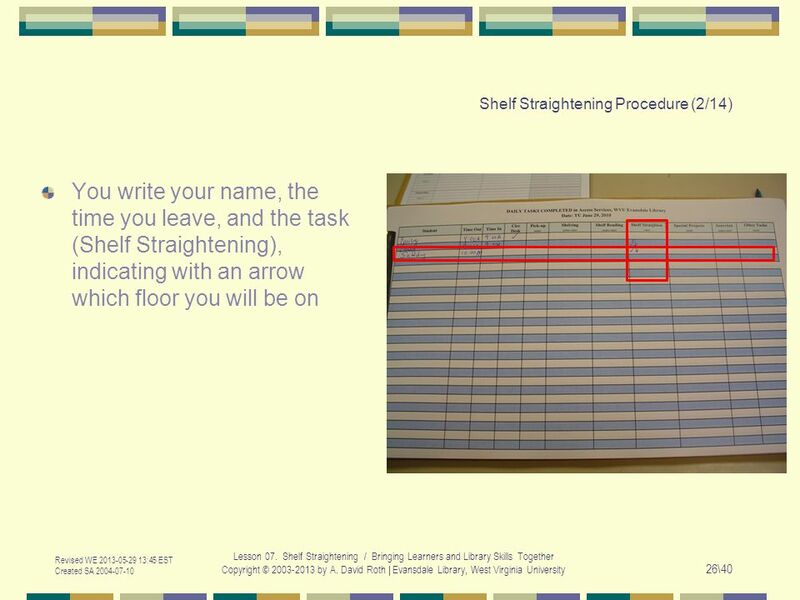 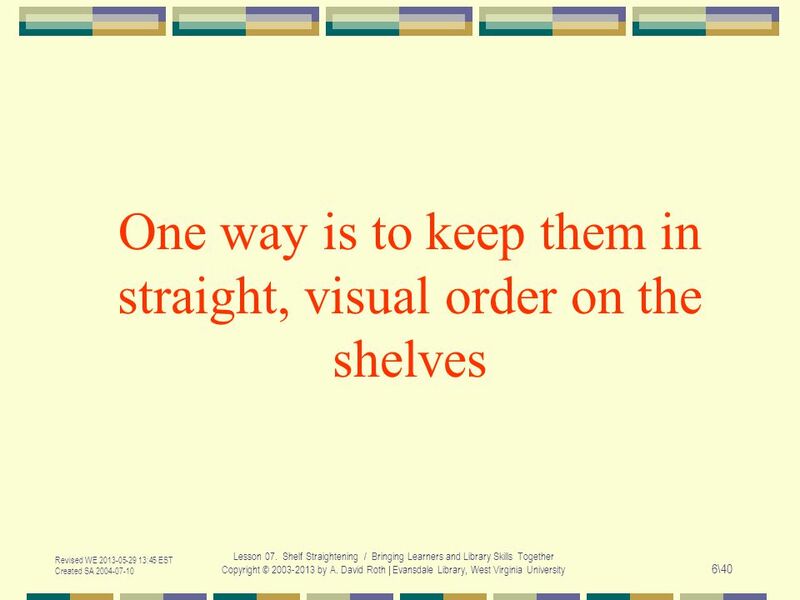 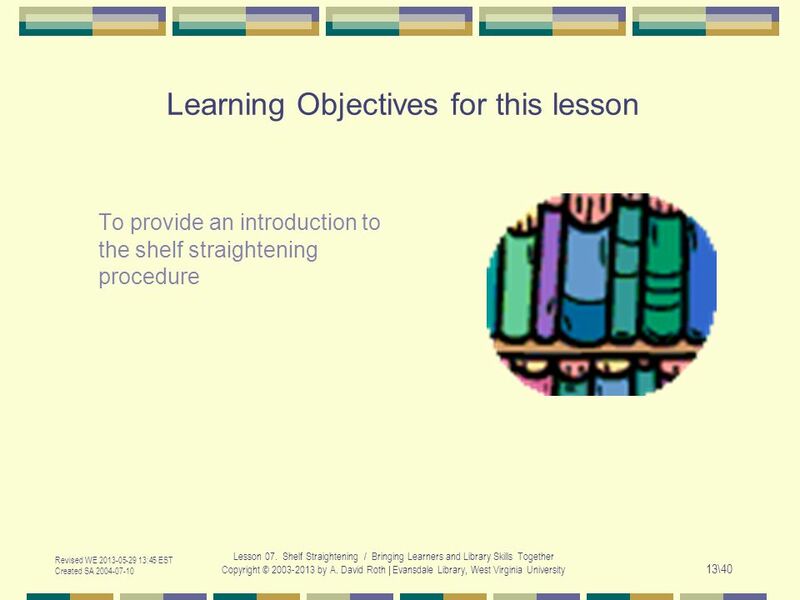 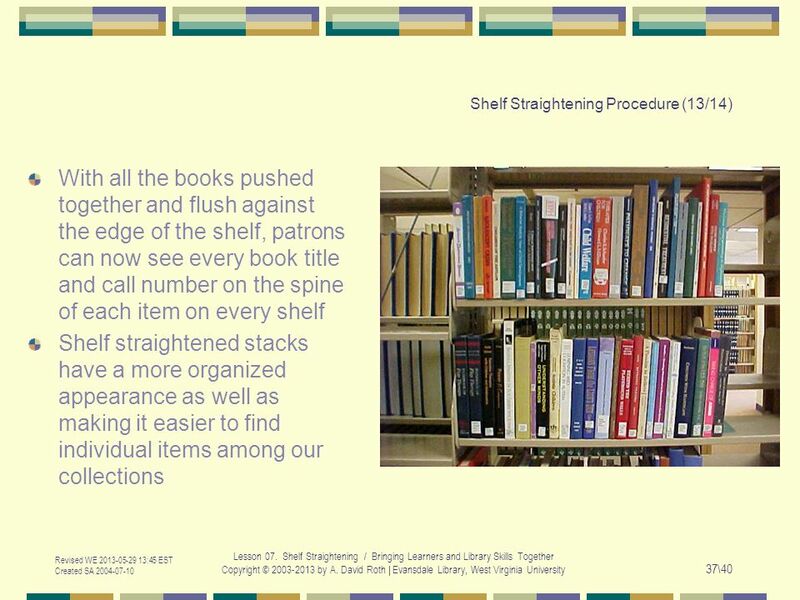 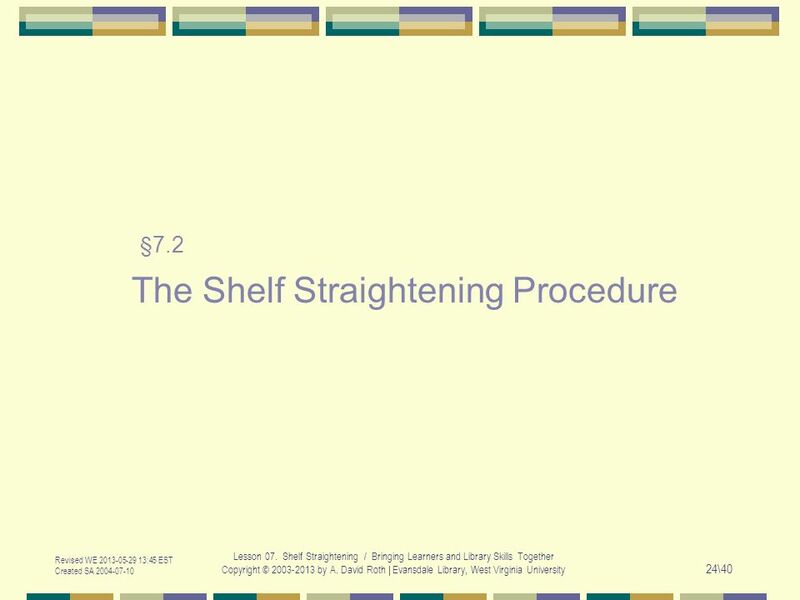 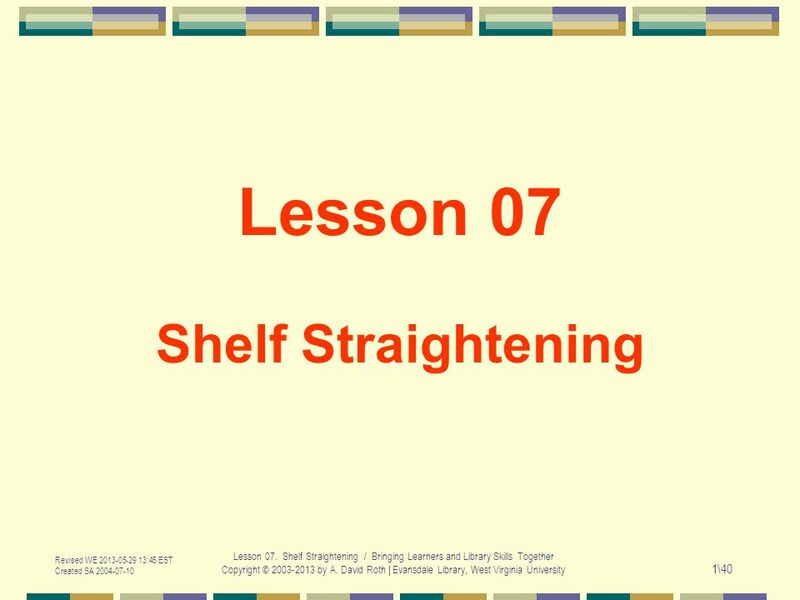 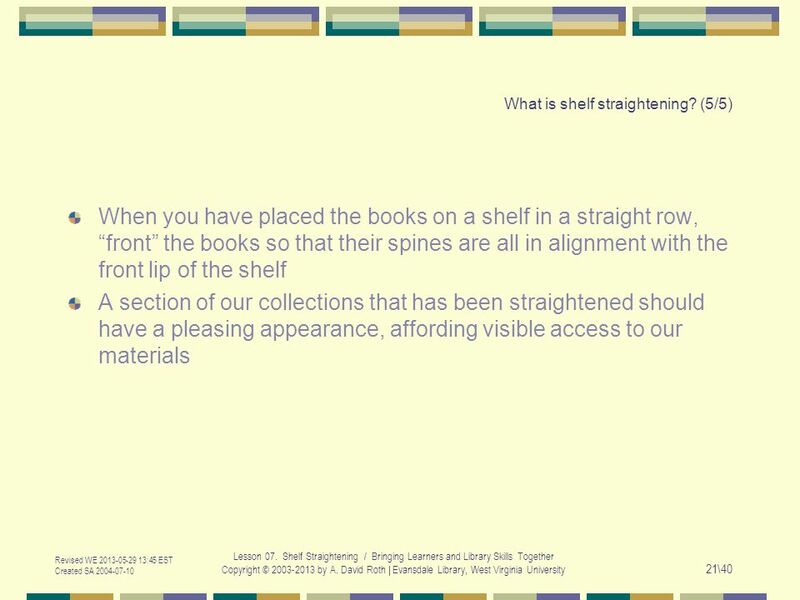 Shelf Straightening / Bringing Learners and Library Skills Together Copyright © 2003-2013 by A. David Roth | Evansdale Library, West Virginia University 16\40 § 7.1 What is shelf straightening and why is it important? 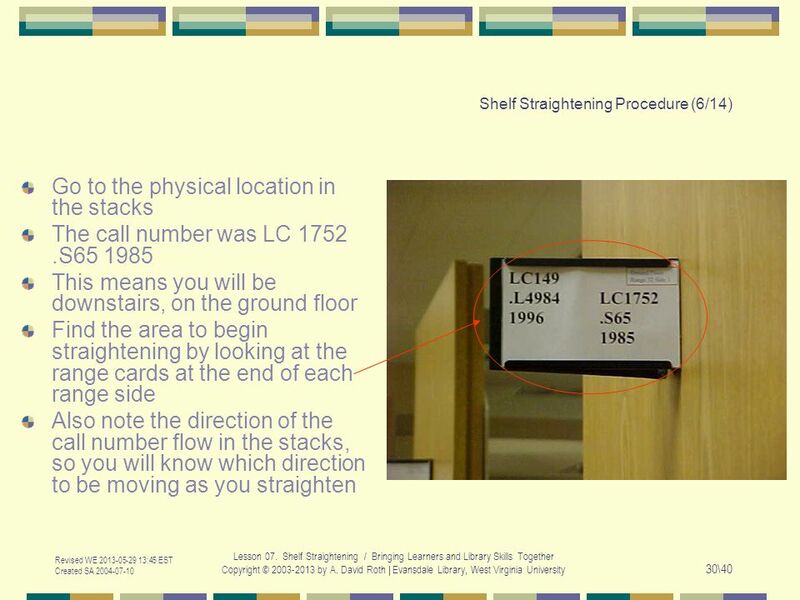 17 Revised WE 2013-05-29 13:45 EST Created SA 2004-07-10 Lesson 07. 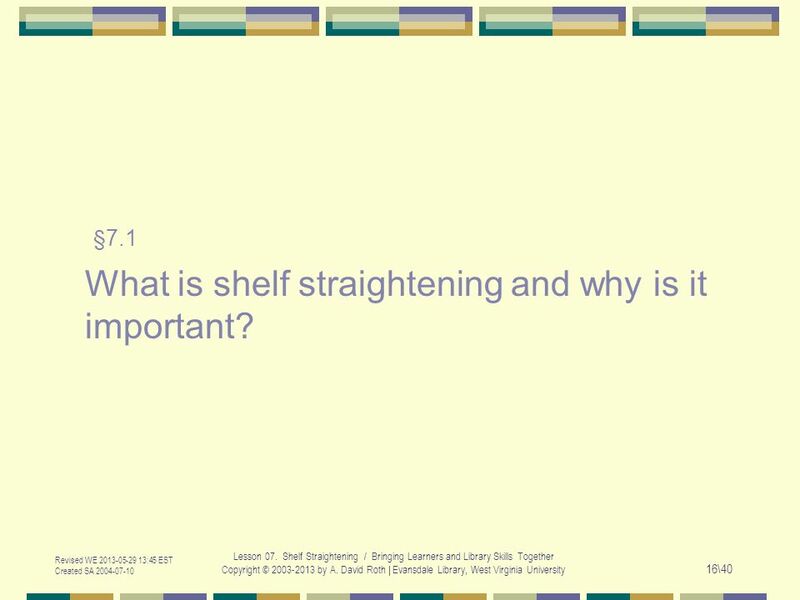 Shelf Straightening / Bringing Learners and Library Skills Together Copyright © 2003-2013 by A. David Roth | Evansdale Library, West Virginia University 17\40 What is shelf straightening? 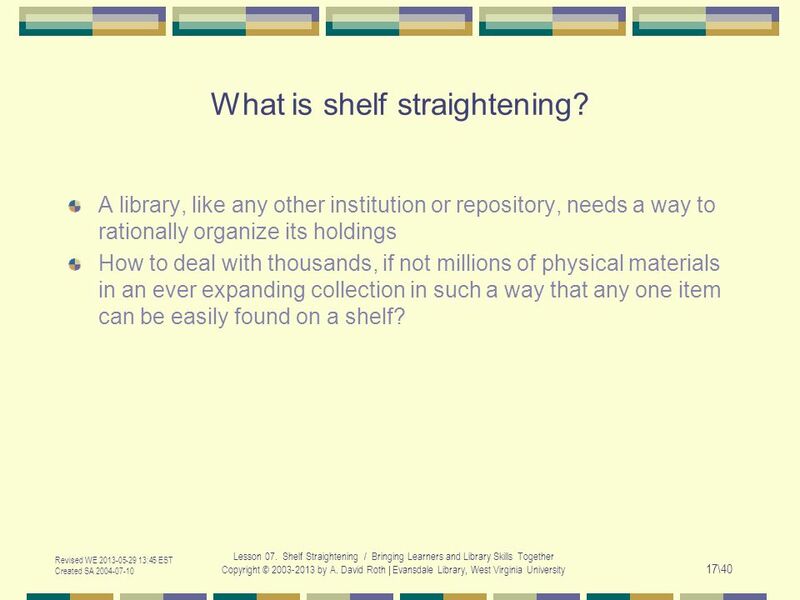 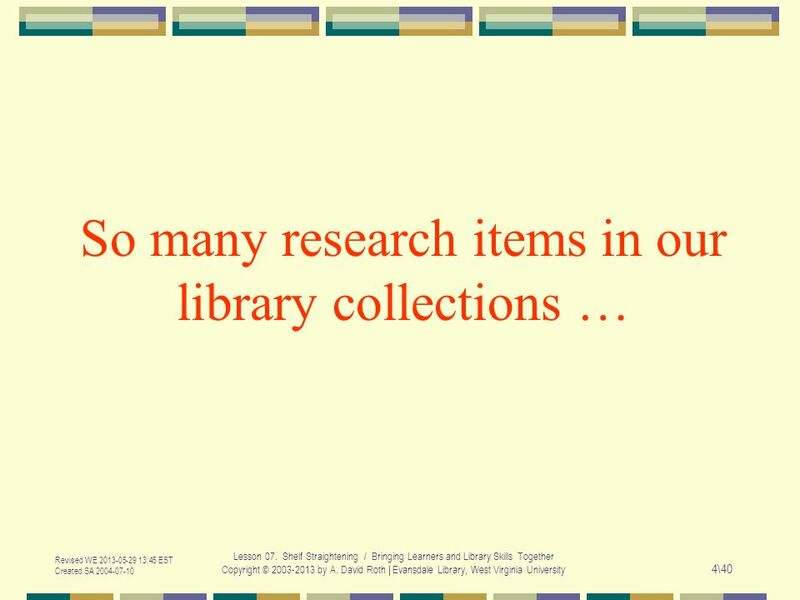 A library, like any other institution or repository, needs a way to rationally organize its holdings How to deal with thousands, if not millions of physical materials in an ever expanding collection in such a way that any one item can be easily found on a shelf? 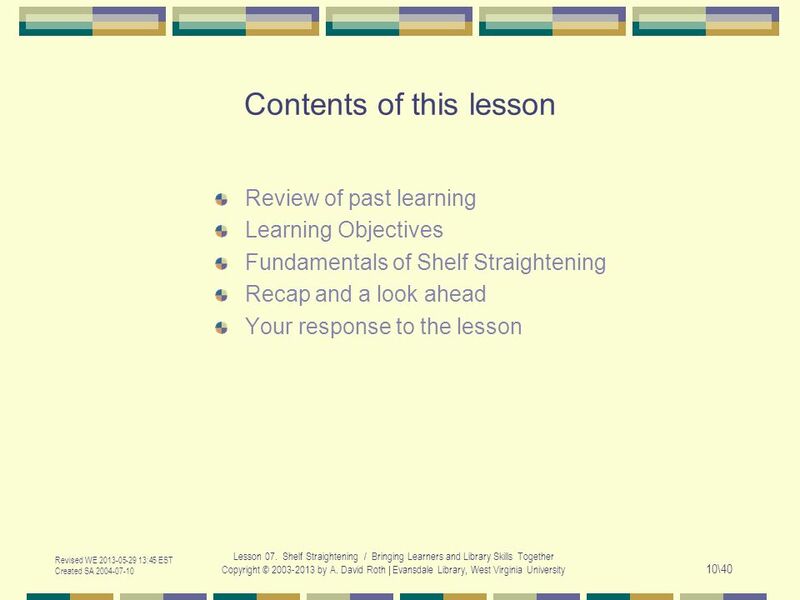 23 Revised WE 2013-05-29 13:45 EST Created SA 2004-07-10 Lesson 07. 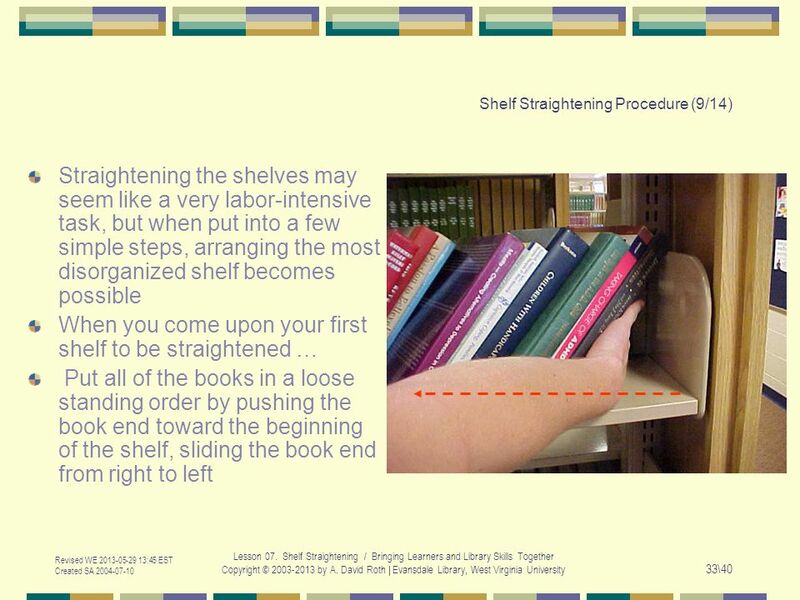 Shelf Straightening / Bringing Learners and Library Skills Together Copyright © 2003-2013 by A. David Roth | Evansdale Library, West Virginia University 23\40 Why straighten shelves? 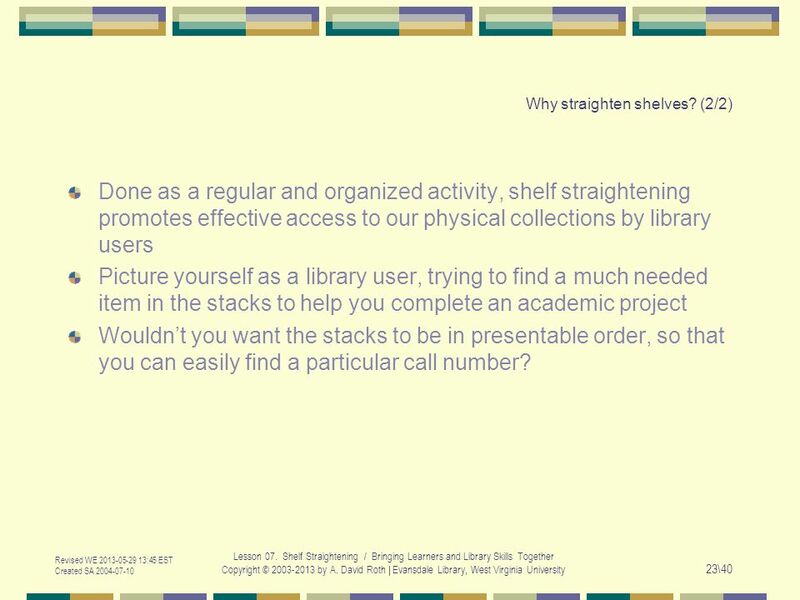 (2/2) Done as a regular and organized activity, shelf straightening promotes effective access to our physical collections by library users Picture yourself as a library user, trying to find a much needed item in the stacks to help you complete an academic project Wouldn’t you want the stacks to be in presentable order, so that you can easily find a particular call number? 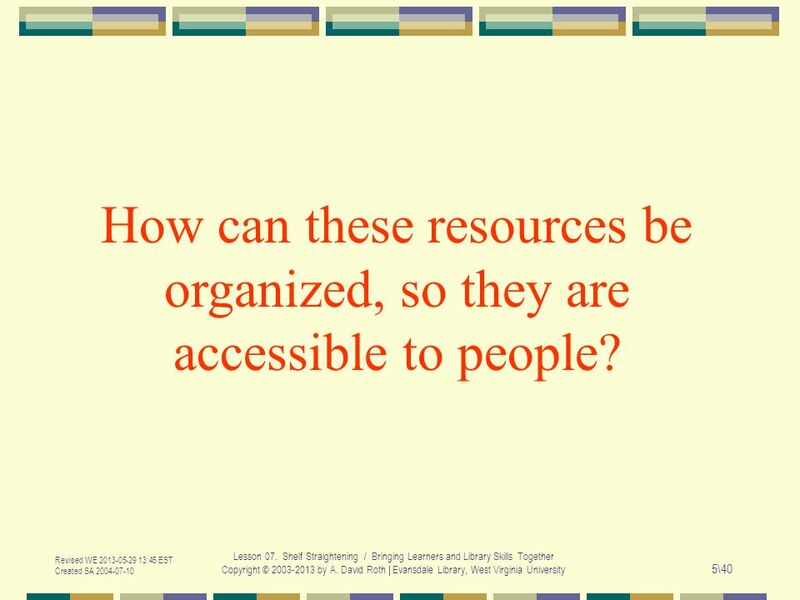 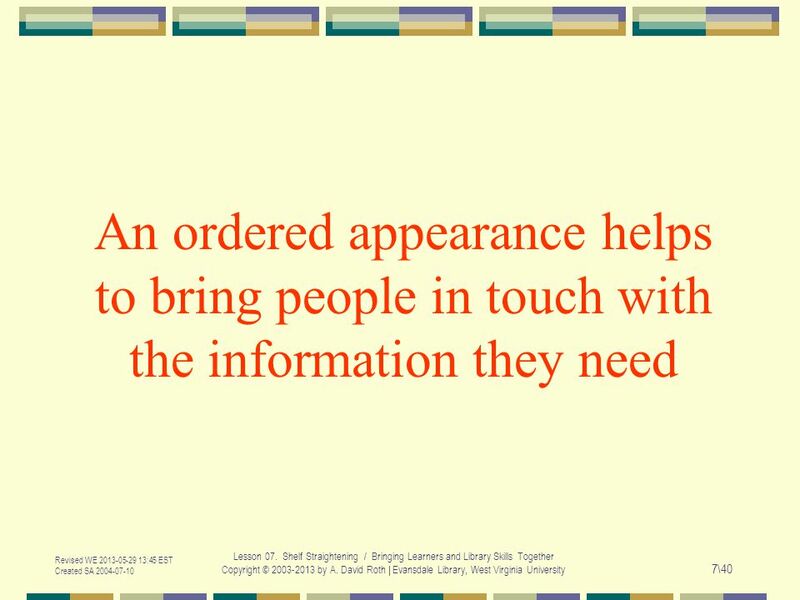 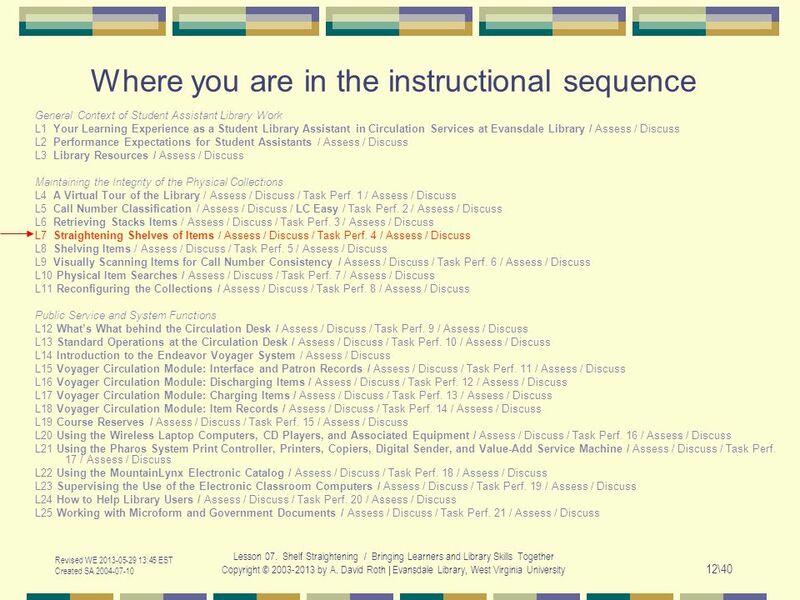 Download ppt "Revised WE 2013-05-29 13:45 EST Created SA 2004-07-10 Lesson 07. 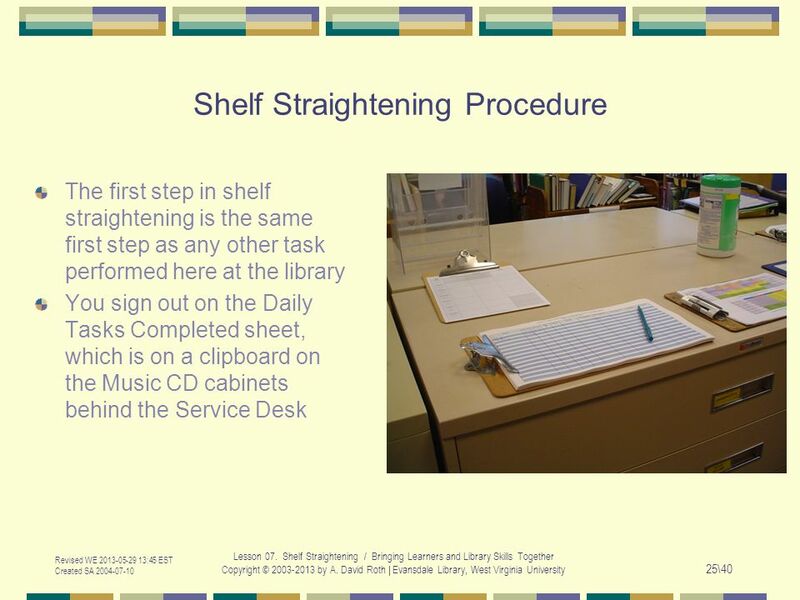 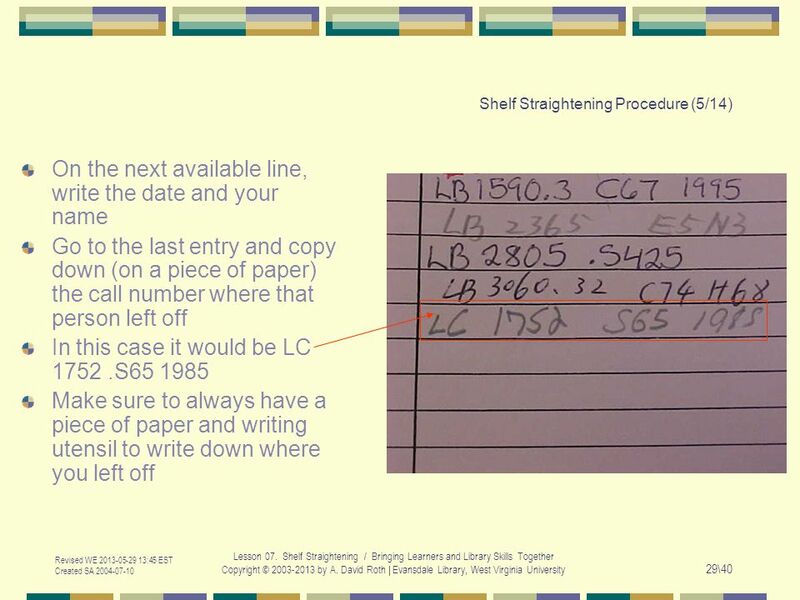 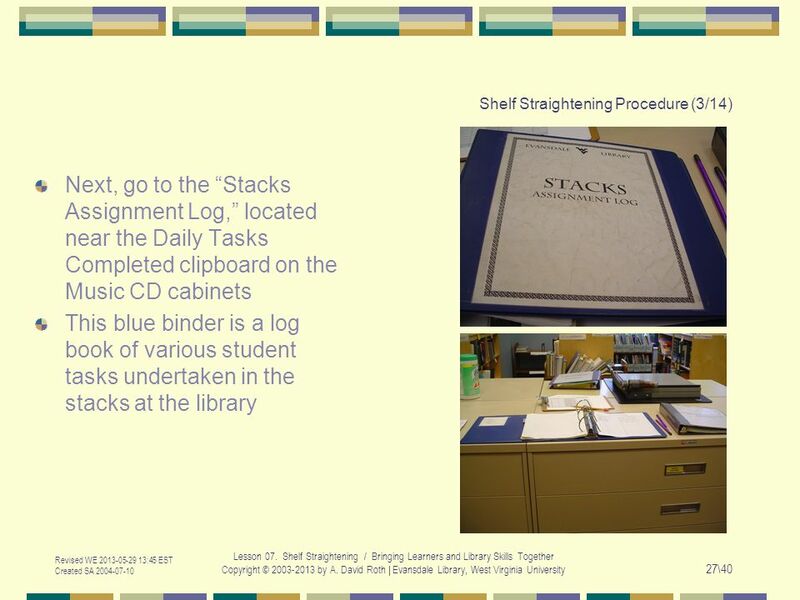 Shelf Straightening / Bringing Learners and Library Skills Together Copyright © 2003-2013." 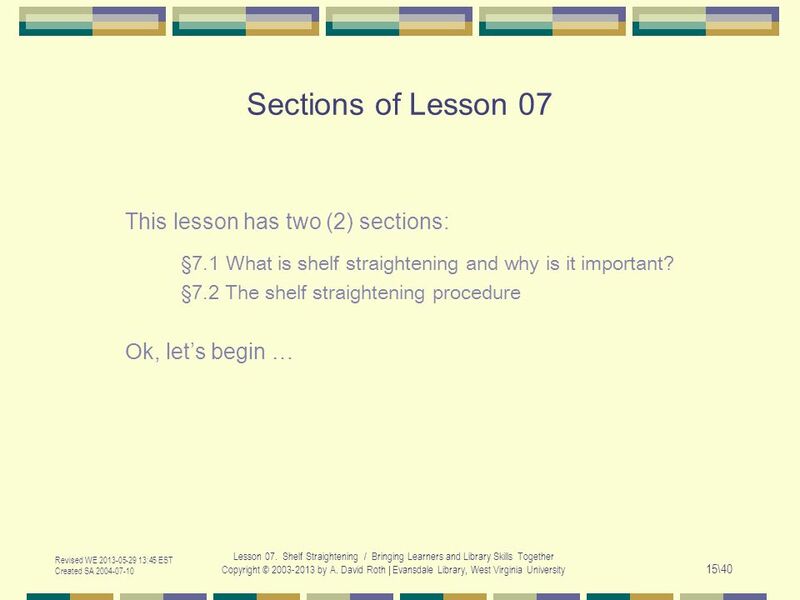 Office 2003 Introductory Concepts and Techniques M i c r o s o f t Windows XP Project An Introduction to Microsoft Windows XP and Office 2003. 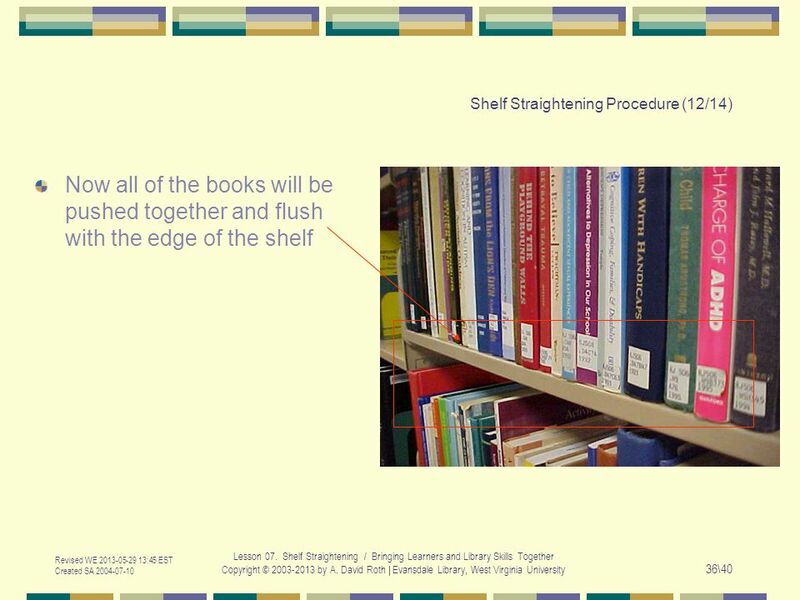 Photo Slideshow Instructions (delete before presenting or this page will show when slideshow loops) 1.Set PowerPoint to work in Outline. 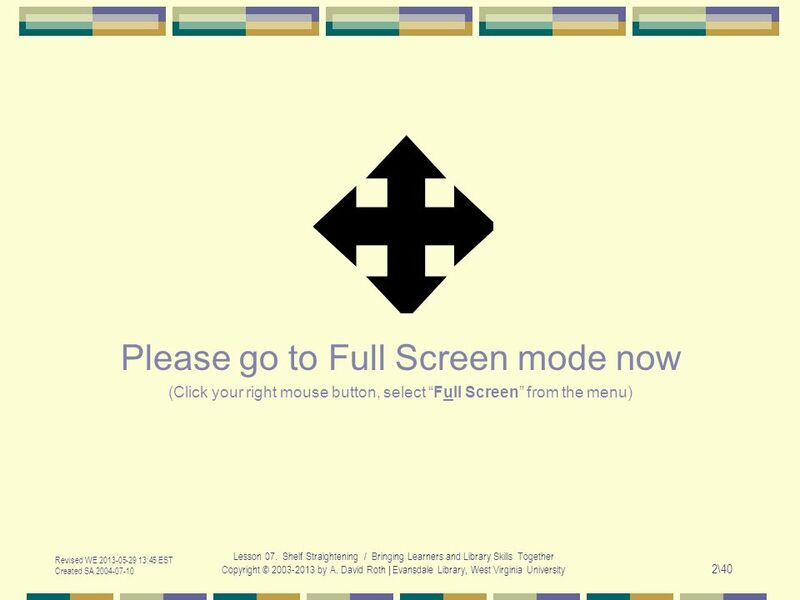 View/Normal click. 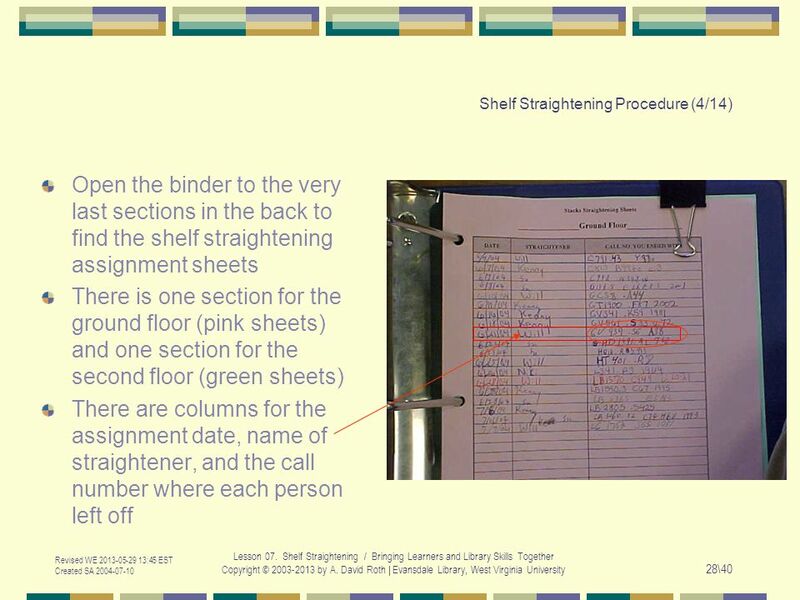 1 School Administrators Guide Standards-based Report Card (SBRC) Special Access/Privileges for School Administrators Interim Reporting Interim Reporting.